1 pair purple nylons (I used these but I wish I'd bought something lighter, like these - $10). These won't be destroyed in the process. Hot glue gun and about 3 glue gun sticks. 1. 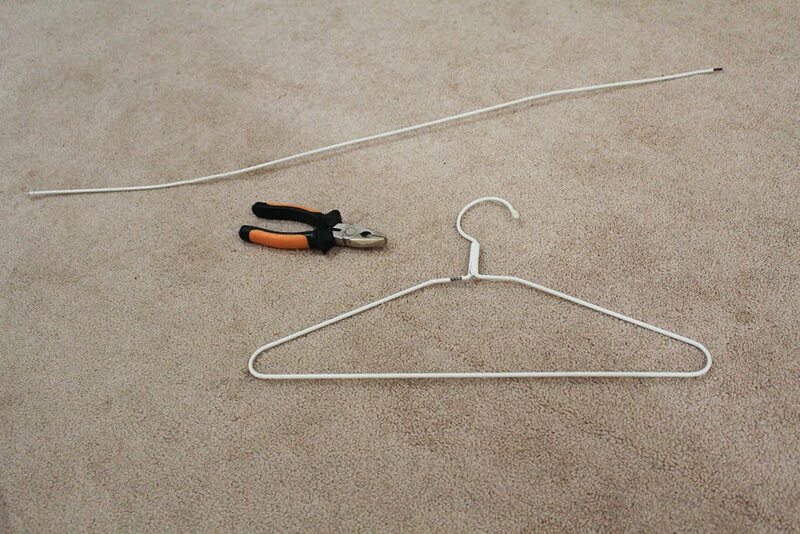 Prepare the hangers: Using the pliers, clip off the hook part of the clothes hangers, and straighten into a line. Handle these carefully - the ends are sharp. 2. Coil the hangers: With your hands, coil one of the hangers. The coil shape won't change so much from here - so fiddle with it until you're happy with it. 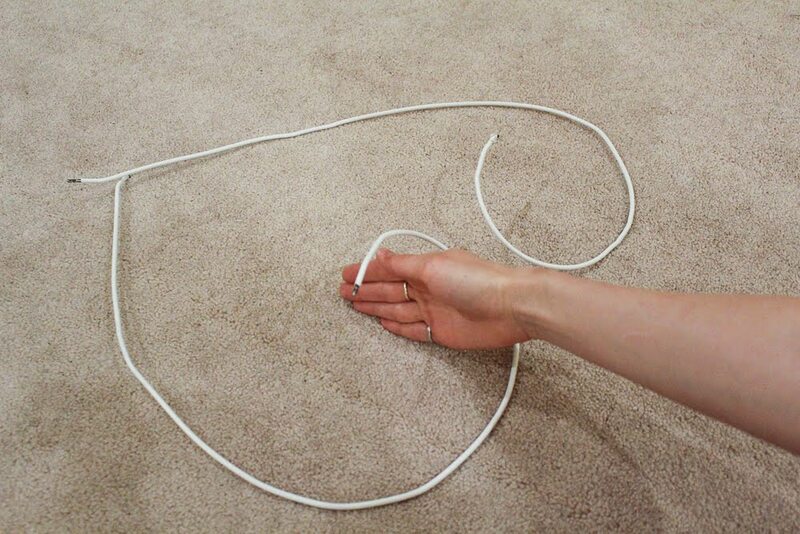 Use the first hanger as a guide to coil the second hanger. 3. Coil the hangers (continued): Bend the top of the coils outwards. The nylon tights will pull the two hangers towards each other so you need the wires to have enough outward bend to keep the nylons stretched and the coil in shape. If the base of the coil was resting on the ground, as shown below, the tip of the spiral was about 5-6 inches from the floor. Make sure the two hangers are bent so that they spiral outwards (opposite directions, not the same direction). Join the two hangers at the center of the coils with masking tape, wrapping them several times over to hide the sharp ends. 4. Prepare the hat: Remove any decorative ribbons from the cloche hat. 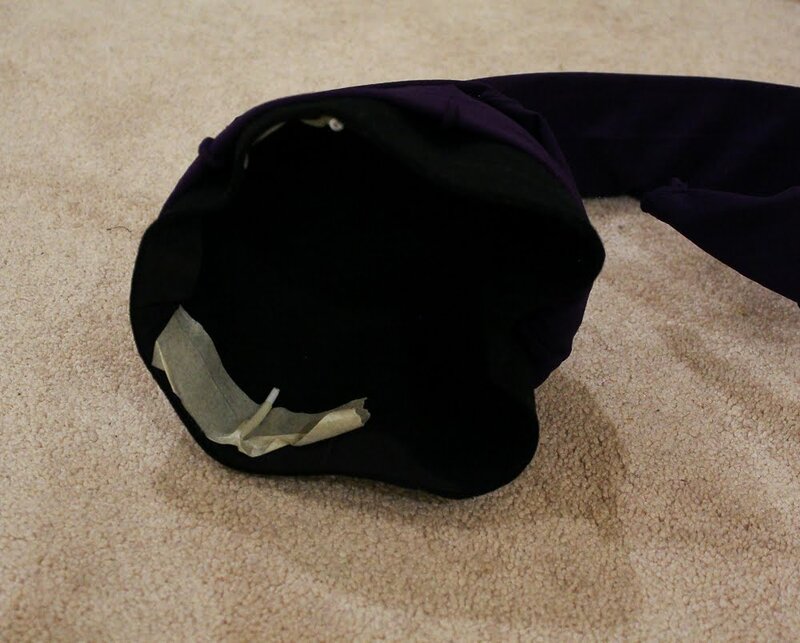 Make a cut through the narrowest part of the brim, towards the bowl of the hat. 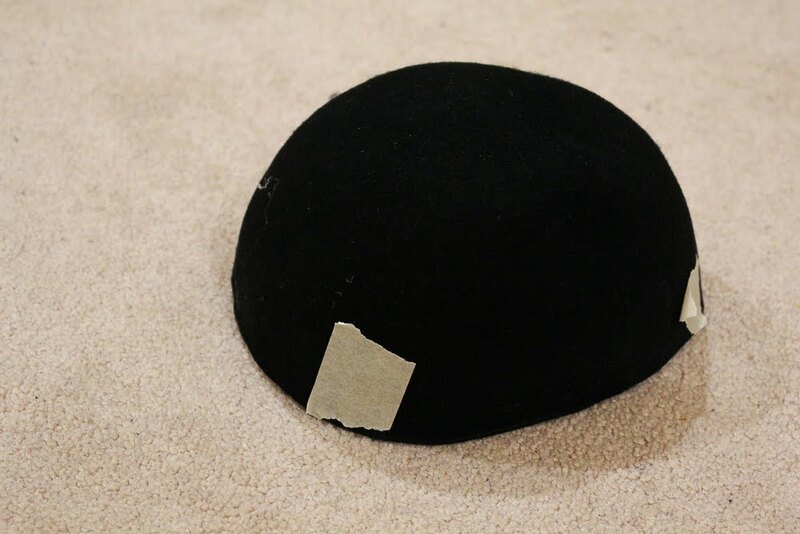 Carefully cut around the base of the bowl of the hat to remove the brim all in one piece. Reserve the brim. 5. Cutting out the widow's peak: Put on the cloche hat. I recommend folding your hair into the bowl of the hat to best mimic how the hat will sit on your head once completed. With a pencil, mark the hat at the center of your brow and at both sides of your face where the curve should end. On one side, mark a spot 1-1.5 inches from the brim roughly above the center of your eye - this is where the cut-out curve will peak. Remove the hat, and use the pencil to draw a smooth curve from the center mark, to the peak mark. Then, draw a gentle taper from the peak to the mark at the side of your head. Put on the hat again to check the curve. When you are happy, cut out the first side of the widows peak. Then, flip over the cut-out and use to trace the second side. Cut out the second side. 6. Put holes at the back of the hat for the hangers: Put the hat back on, widow's peak carefully centered. Use masking tape to mark the two spots about an inch behind the base of your ears. Take the hat back off, and use scissors to stab two holes at the marked positions, about 2 inches from the edge of the hat. 7. Attach the hangers to the hat: Hold the taped hangers to the back of your head to gauge the height of the coil. I ended up cutting off the bottom 4 inches of the wires to make the height more reasonable. When you're happy with the length, thread the base of the wires through the holes you made before, and fasten on the inside with masking tape. Move it carefully at this point - it isn't very sturdy yet. 8. Cover the wire in nylons: At this point, it helps to find a friend who will sit patiently for you for ten minutes. Otherwise, put on the hat yourself, but your arms will get a bit tired. Slide one of the nylon legs over the wire coils. 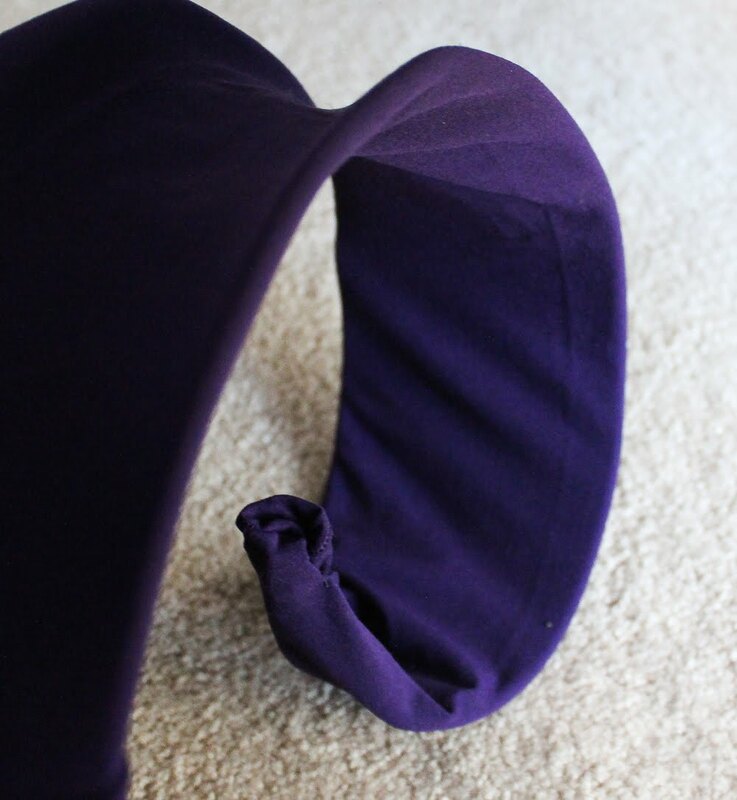 Pull the waistband of the nylons down to sit around the crown of your head, tucking the second nylon leg under. Spend some time arranging the folds of the nylons, this is largely how it is going to look. Fold the toe of the nylon stretched over the wire into a point and fasten with 3-4 small stitches as shown below. You should be able to take the hat on and off without needing too much rearrangement. 1. Shape the collar: Hold the trimmed-off brim of the cloche hat around your neck upside-down so that it fans outward. Mark where you want the ends of the collar to be. I cut off around 2 inches from either side. Taper the ends so that both the bottom and the top of the collar have a smooth curve rather than a blunt end. 2. Glue on the feathers: Mark with a pencil on the side of the brim where you want the feather fan to begin. 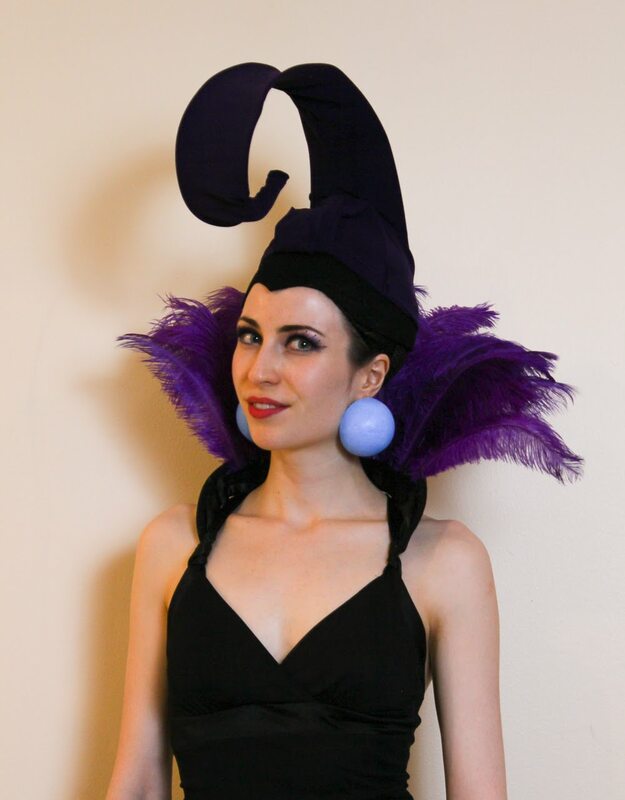 Heat up a hot glue gun, and glue feathers onto the inside of the brim/collar with the feathers pointing outwards ("downwards" if the brim was still attached to the hat). I used all 30 feathers, and mine were quite closely packed. Careful not to burn yourself on the glue (I did....). If some of your feathers are a little bent out of shape, a hair straightener run quickly over the feather works well to flatten the quill. 3. 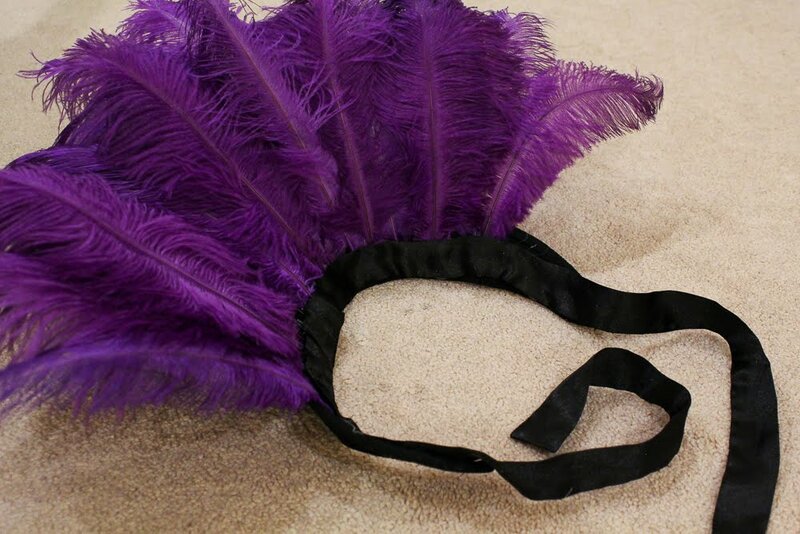 Line the feather bottoms with ribbon: Because both the inside and the outside of the collar are visible, I covered the base of the feathers with a ribbon to look a little more polished. Spread a line of glue along the base of the collar, and align the bottom of the ribbon along it, leaving enough extra ribbon at the ends to fasten the collar around your neck or too your dress straps. Press the ribbon in and let it cool for a few minutes. Then, fold back the top of the ribbon and add a second line of glue about an inch above the first line of glue. Press in the top of the ribbon and allow to cool. I had originally planned to tie the two ends to the ribbon together and let them hold the collar in a stiff circle, balanced on my shoulders. This worked completely fine and was surprisingly comfortable, however I then realized I could also tie each ribbon end to my dress strap and that ended up looking a little more flattering. I was originally not planning on adding the earrings since they didn't seem like an "essential" part of the costume, however something seemed off about the balance and color scheme of the character design without them. While these are certainly very easy to throw together, other large blue earrings could also suffice. 1. Cut the Styrofoam craft ball: Using a sharp knife, slice a large Styrofoam ball along the seam into two halves. 2. 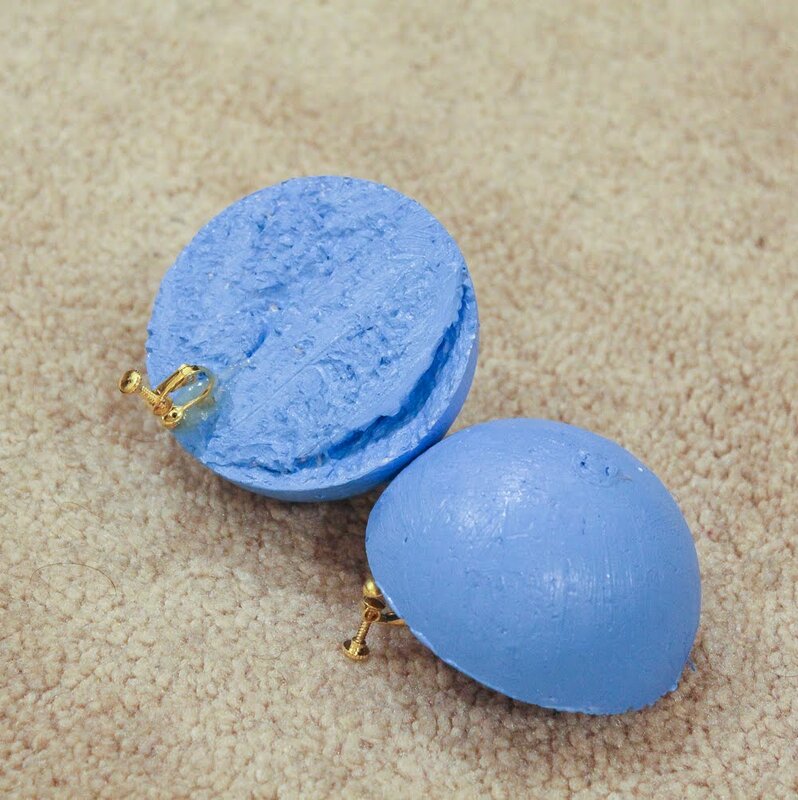 Paint the Styrofoam hemispheres: Mix together a periwinkle blue acrylic color and liberally coat both the curved part and the flat part of the foam hemispheres. Be sure to get the paint into all the nooks and crannies. 3. Attach the earring fasteners to the foam: Put a dab of hot glue towards the rim on the flat side of the foam hemispheres. Press in the earring fastener front and allow to cool. Put on your make-up: fill in eyebrows, liberally apply purple eye shadow, dramatically line upper and lower lids in black eyeliner, coat lashes in mascara and then carefully apply false eyelashes. Wrap your hair in a hairnet to keep it secure throughout the night (will be slightly visible, so choose a black hairnet or a hairnet that closely matches your hair color. Put on the headpiece and make any adjustments to the nylon wrappings. Fasten the feather neck piece around your shoulders. Slip on your shoes and find your trick-or-treat bag. Halloween night, 8pm google search: "How to put on fake eyelashes." Halloween night, 2am google search: "How to remove fake eyelashes." What a brilliant idea. Thanks for sharing. Your costume turned out great!